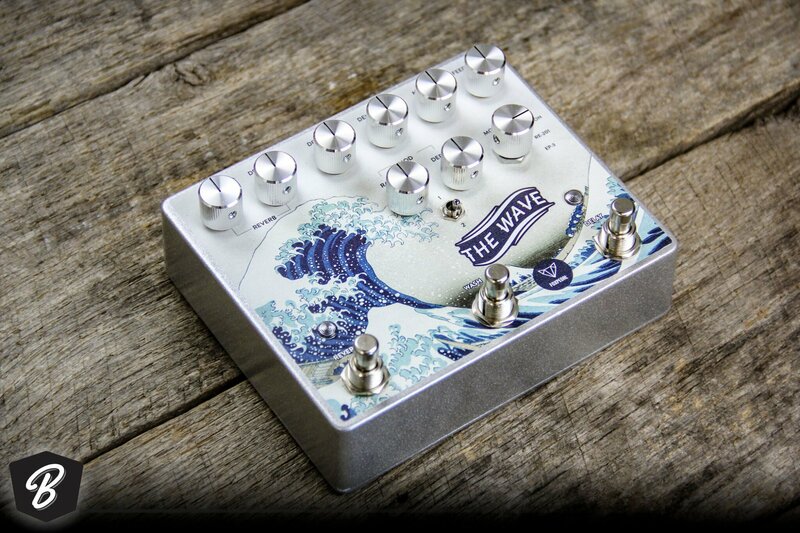 This tsunami of tone delivers classic tape delay sounds in an Analog/Digital hybrid. Featuring dual programmable delay times, its easy to dial in some incredible ambiance. Take it from simple slap-back all the way to the outer reaches of the universe. The three-way tape mode knob lets you chose from three classic tape delays. Binson Echorec: Get one long repeat followed by multiple shorter repeats. This classic tape delay was used extensively by Pink Floyd in their early years. Totally nebular. Roland RE-201 Space Echo: Dual rhythmic repeats in a classic warm gritty delay. Used by everyone from Radiohead to Brian Setzer (who knew?). This is our favorite mode. Add tape-style warble to the delay signal with this incredibly rich optical modulation. With the flip of a switch you can set the modulation to either the first or second delay signal, or turn it off completely. Set it to the second delay signal, set the depth low and the rate to slightly off-match your delay to dial in some really messed up tape sounds. Using the new Belton V3 reverb brick, this reverb creates some gorgeous dark natural vibes. Just adjust it up or down, or disengage it completely to suit your liking. The new "Decay" control allows you to adjust the room size and amount of modulation. The middle stomp switch is a momentary switch that shorts the feedback knob bringing you straight to spaced out oscillation and release to bring it back to the knob feedback setting. Dimensions: 5.6" x 4.6" x 1.6"